Beautiful 3 Bedroom, 3 Bath Home in Thunderbird Villas! 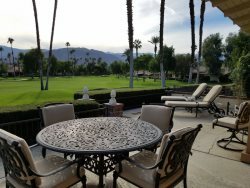 Thunderbird Villas is one of the most desirable residential communities in Rancho Mirage. Located on a hilltop within the gated community, this lovely 3 bedroom, 3 bath home offers majestic views of the mountains and surrounding cities. As you enter the rod iron gates into the tiled courtyard, the stucco walls, potted flowers and arch shaped double doors create a Mediterranean atmosphere. Once inside, you are greeted by wood beamed cathedral ceilings, a built in bar and fireplace nestled in the vast great room overlooking the patio. Ceiling to floor windows provide roof top and patio views from the great room and formal dining area. The tiled patio has a built in spa that comfortably seats 4 as well as a dining table and chaise lounges to enjoy the breathtaking view. In the formal dining room, a dramatic table that seats 6 is just steps away from the well equipped kitchen. An extended counter within the kitchen provides seating for a quick cup of coffee or snack. A side courtyard and patio enables the outdoor chef to step out of the kitchen to grill on the gas barbecue. The three bedroom suites with walk in closets and flat screen TV’s provide ample space for you and your guests to relax and unwind. The master bedroom with a king size bed and large sitting area creates a cozy area to watch TV or read. The en-suite includes double sinks and walk in shower. The second bedroom offers 2 twin beds with a desk and an en-suite with private bath and tub/shower combination. The 3rd bedroom provides two full size beds, flat screen TV, and vanity/sink with access to the bathroom with walk in shower. A community pool and Jacuzzi is just down the street. Wireless connection is offered as well as free local and long distance U.S. and Canada calling. Sorry, no pets.